For other uses, see Slippery Rock (disambiguation). Slippery Rock is a borough in Butler County, Pennsylvania, United States. The population was 3,625 at the 2010 census. It is home to the Slippery Rock University of Pennsylvania. Slippery Rock is included in the Pittsburgh, PA Metropolitan Statistical Area. 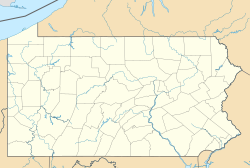 Location of Slippery Rock in Butler County, Pennsylvania. Slippery Rock is located in northwest Butler County at 41°3′49″N 80°3′18″W﻿ / ﻿41.06361°N 80.05500°W﻿ / 41.06361; -80.05500 (41.063746, -80.055007). According to the United States Census Bureau, the borough has a total area of 1.7 square miles (4.3 km2), all of it land. Slippery Rock Creek, the borough's namesake, runs through a valley 2 miles (3 km) south of the borough. Since the 1960s Slippery Rock has been well served by the Interstate Highway system as Interstate 79 (north-south) and Interstate 80 (east-west) cross 12 miles (19 km) to the north. The closest access to I-79 is 4 miles (6 km) to the west on Pennsylvania Route 108. PA 258 (N. Main Street) leads northwest 7.7 miles (12.4 km) to I-79. The terrain around Slippery Rock is hilly, and the strip mining of coal has been a prominent commercial activity in the surrounding area, which is largely agricultural. As of the census of 2000, there were 3,068 people, 977 households, and 387 families residing in the borough. The population density was 1,820.4 people per square mile (700.9/km²). There were 1,039 housing units at an average density of 616.5 per square mile (237.4/km²). The racial makeup of the borough was 91.30% White, 3.26% African American, 0.20% Native American, 3.29% Asian, 0.07% Pacific Islander, 0.68% from other races, and 1.21% from two or more races. Hispanic or Latino of any race were 1.11% of the population. There were 977 households, out of which 15.3% had children under the age of 18 living with them, 30.8% were married couples living together, 6.4% had a female householder with no husband present, and 60.3% were non-families. 27.7% of all households were made up of individuals, and 12.8% had someone living alone who was 65 years of age or older. The average household size was 2.38 and the average family size was 2.71. In the borough the population was spread out, with 8.5% under the age of 18, 55.9% from 18 to 24, 15.0% from 25 to 44, 10.1% from 45 to 64, and 10.4% who were 65 years of age or older. The median age was 23 years. For every 100 females, there were 77.2 males. For every 100 females age 18 and over, there were 74.8 males. The median income for a household in the borough was $24,554, and the median income for a family was $42,450. Males had a median income of $37,188 versus $30,104 for females. The per capita income for the borough was $13,538. About 10.1% of families and 42.6% of the population were below the poverty line, including 11.0% of those under age 18 and 8.0% of those age 65 or over. The university has many sports events and venues located in the borough. The Rock football team plays their games at Bob DiSpirito Field at N. Kerr Thompson Stadium, while the baseball team has their games at Jack Critchfield Park. In 2007, the Slippery Rock Sliders of the Frontier League played their first season in Slippery Rock at Jack Critchfield. They left the borough after their first season, and are now the Midwest Sliders of Ypsilanti. However, the Slippery Rock Sliders name, logo, and colors have been purchased by the Slippery Rock Sports Group, LLC, for the borough's new entry in the summer-collegiate Prospect League at Jack Critchfield. ^ a b "Geographic Identifiers: 2010 Demographic Profile Data (G001): Slippery Rock borough, Pennsylvania". U.S. Census Bureau, American Factfinder. Retrieved March 27, 2014.